Resize paper 3 to 23%, paste, apply your mask, delete and merge group. Resize paper 4 to 23%, paste, apply your mask again, delete, merge group. Paste scalloped frame, resize to 25%, free rotate to the left or right, duplicate, free rotate to the left at 15, duplicate, mirror, moving both below the top frame. Click inside the top frame with your magic wand, you will have to click a few times, expand by 5, resize paper 9 to 23%, paste, invert, delete, then resize your tube to 50%, mirror, paste, delete, select none. Change the blend mode to overlay, moving both below the frame layer. Apply the Xero filter-Radiance to your tube. Duplicate the paper in the frame, free rotate to the left, move below the other frames, duplicate, mirror, lining them up with the other frames. Being on the top frame, resize your tube to 30%, paste more to the left side. Resize the painted rose to 15%, apply Mura Meister Copies-Encircle with the first number on 12, move to just above the mask layer. Resize the Rose Vine to 25%, free rotate to the left at 90, apply Mura Meister Copies-Encircle with the first number on 20, move below the painted rose layer. Resize the heart vine bow to 10%, paste on each corner of the frame, top and bottom. 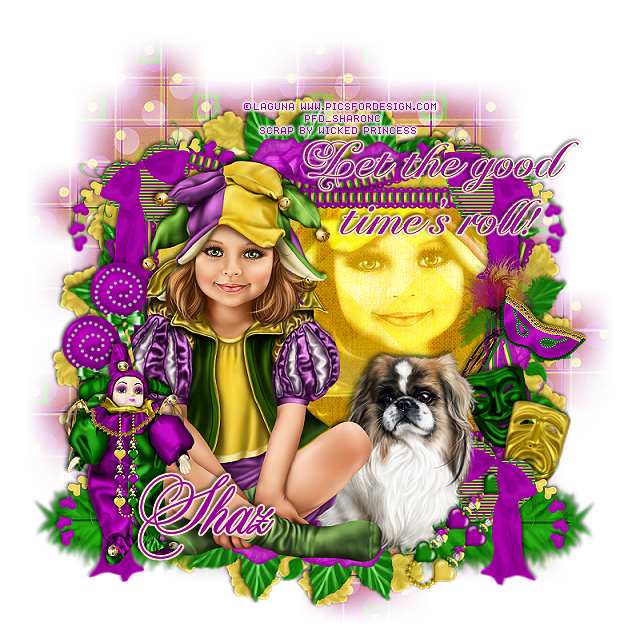 Resize the Mardi Gras doll to 20%, paste on the left above the tube layer. Resize the two mask to 10%, free rotate one to the left at 15 and one to the right at 15, paste on the right side below the heart vine. Resize the feather mask to 15%, paste on the right below the face masks. Resize the Jester necklace to 5%, place on the doll, erase the chain a bit at the top. On the original necklace, resize to 10%, free rotate to the right at 45, place on the right side below the mask layer, duplicate, move above the tube layer, erase the chain over the mask and any other part you do not want showing. Resize the feather to 15%, free rotate to the left at 90, place at the bottom below the heart vine layer, duplicate, mirror. Resize the lollipop to 25%, free rotate to the left at 10, place behind the tube on the left, duplicate, move up some. Resize the wordart to 10%, place at the upper right, apply a medium white gradient glow.